Rifle High School running backs, from left, Brooks Pressler Brock Clark, Layton Stutsman (quarterback), Blaine Vance and Ty Leyba have been the primary ballcarriers forthe Bears this season. They've taken pride in sharing the ball, and they'll have a chance to do that again when the Bears host Fort Morgan in the Class 3A semifinals at 1 p.m. Saturday at Bears Stadium in Rifle. What: Semifinal round of the Class 3A state football playoffs. Radio: KNAM, 1490-AM, and KMTS, 99.1 and 99.5-FM. Forecast: High with kickoff is expected to approach the low 40s with a 50 percent chance of rain. How they got here: Rifle defeated 11th-seeded Northridge 61-13 in the first round on Nov. 8, then defeated No. 3-seeded Roosevelt 15-0 in the second round Nov. 15 in Johnstown. Fort Morgan defeated No. 7 Holy Family 35-18, then earned a 13-7 victory over second-seeded Evergreen on Nov. 15. What’s at stake: Saturday’s winner advances to play in the Nov. 29 state championship game against either fourth-seeded Pueblo East (9-3) or top-seeded Discovery Canyon (12-0) at a site to be determined. Go ahead and start throwing cliches out there. For sure, almost every cliche could be applied to the offensive backfield of the Rifle High School football team, which has made a habit of harping on humility in recent years. Regardless of who gets more of the carries or who scores the most touchdowns, every ball carrier is genuinely happy for the success his teammate has. Granted, 16 players have carried the ball this season for the Bears (11-1 overall), who head into Saturday’s Class 3A state semifinal football game against Fort Morgan averaging 295.8 rushing yard per game. But the five players who have gotten most of the carries — senior quarterback Layton Stutsman, and running backs Brooks Pressler (senior), Brock Clark (senior), Blaine Vance (sophomore) and Ty Leyba (junior) — have made it a habit to give props to their teammates before themselves. That team effort has accounted for, in recent years, one of Class 3A’s most productive offensive attacks. Rifle has a per-game average of more than 350 yards of total offense since the 2011 season, helping them compile a 43-6 overall record and four consecutive Class 3A Western Slope League titles. From 2011 to 2013, the Bears had produced more than 330 rushing yards per game but have leaned toward passing the ball more this season. And in each one of those seasons, including this one, Rifle has used a philosophy of not only sharing the ball, but sharing the credit for the team’s success. But it’s definitely worked for the Bears — and for a while now. One example is former Rifle running back Ryan Moeller, who’s career rushing total of 7,043 yards ranks him fourth on Colorado’s all-time rushing yards list behind Fort Morgan’s Dusty Quick (7,474 yards from 1998 to 2001). Wells recalled once during Moeller’s sophomore year in the 2010 season that he told the running back he’d just passed 1,000 rushing yards for the season. “And he said to me [sarcastically], ‘Great! Do I get a trophy for that or something?’” Wells said with a laugh. Moeller is now a redshirt freshman at the University of Colorado in Boulder. He’s playing as a defensive back, but he’s getting most of his playing time on the Buffaloes’ special-teams squads. 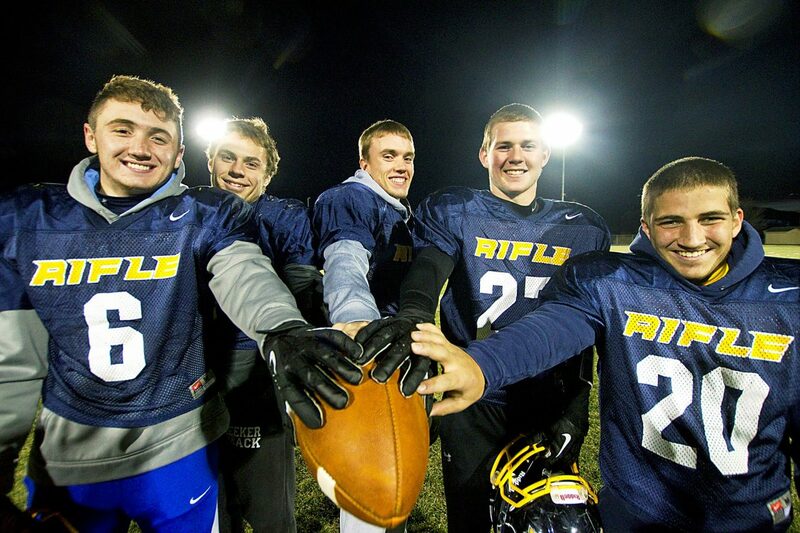 Meanwhile, the current Rifle squad, though it’s not putting up eye-popping rushing numbers like Moeller did (3,002 yards, 50 touchdowns in 2012), has maintained the team-first, sharing-the-wealth philosophy that Rifle has maintained through the years. That shows on the team’s stat line. Clark, the biggest of the Bears’ five primary ballcarriers, has 1,228 rushing yards on 137 carries with 19 touchdowns, including 133 rushing yards and a TD during the Bears’ 15-0 second-round victory at Roosevelt on Nov. 15. He wasn’t even the leading rusher, though, as Vance finished with 150 yards on 25 carries to help the Bears maintain possession of the ball in the cold and snowy conditions at Peterson Field. Leyba’s 13-yard scoring run with less than two minutes gone in the fourth quarter against Roosevelt served as the go-ahead score for the Bears, but it’s not the only big play he’s had this season. During Rifle’s 62-7 season-opening victory over Moffat County on Aug. 22, Leyba amassed 208 rushing yards and three touchdowns on just six carries. Stutsman has the ability to read defenses at the line of scrimmage and change plays when he sees openings with opposing defenses. He’s also effective when he calls his own number (362 rushing yards, eight TDs), and also has 13 touchdown passes this season with just three interceptions. Pressler has been slowed by an ankle injury he sustained in October, but Vance has increased his production since then on his way to a career-high rushing total this past Saturday.